The process begins with careful attention to design. 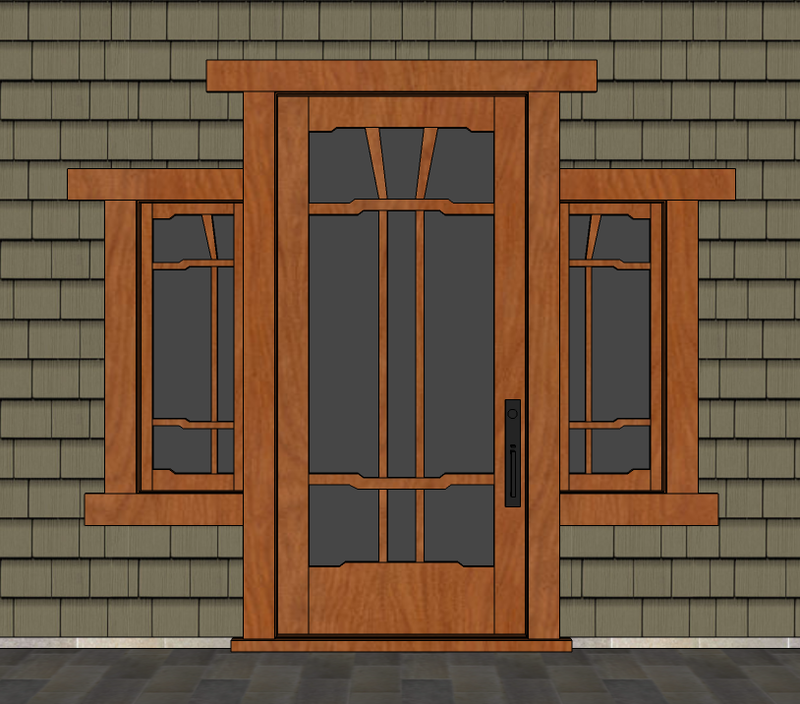 I use 3D programing to draw a model of each door before any wood is cut, which allows the customer to see in better detail what the end product will look like. It also gives me an opportunity to work out any possible issues that may arise during the construction process and to generate an accurate list of measurements to work from. I have a collection of 3D drawings that I use as a starting point when working with new customers, in order to narrow down the design that will work best for their home. Once we determine the general design, I generate a couple of new drawings to further refine the concept until it is ready for construction. At this point, a materials deposit is used to order all lumber and other materials, and the door is put on the shop schedule. 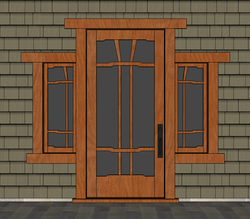 The woods I use for door construction are Douglas-fir, African or Honduran mahogany, quarter-sawn white oak, reclaimed old-growth redwood, and cherry. All of these are remarkably stable woods and are naturally resistant to warping from humidity changes. 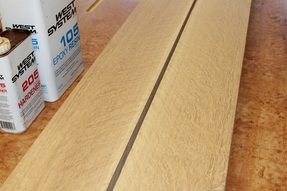 Most of my doors are built from solid lumber, but in some cases I will laminate boards together to make the thickness. This gives me the ability to build doors that are thicker than the available material, or to select a particularly beautiful board and slice it into 1/8" thick faces that can be applied to all the boards for that door. All laminations, as well as all joinery done for exterior applications, are glued with a two-part marine grade epoxy, which is designed to withstand the harshest possible conditions. Traditional Mortise-and-Tenon construction is used throughout. Many doors built this way have lasted centuries, even with the poor glues available at the time. The joint itself, if properly fit, takes the weight and strains directly, instead of relying on the glue. My method for cutting a perfect tenon is to machine it slightly larger than the mortise in which it will fit. Then the fine-tuning is done with a rabbeting hand plane, honed to a razor edge. With this plane, I can take off as little as .001 inch, giving me the ability to achieve a "piston" fit, allowing only enough room for glue. 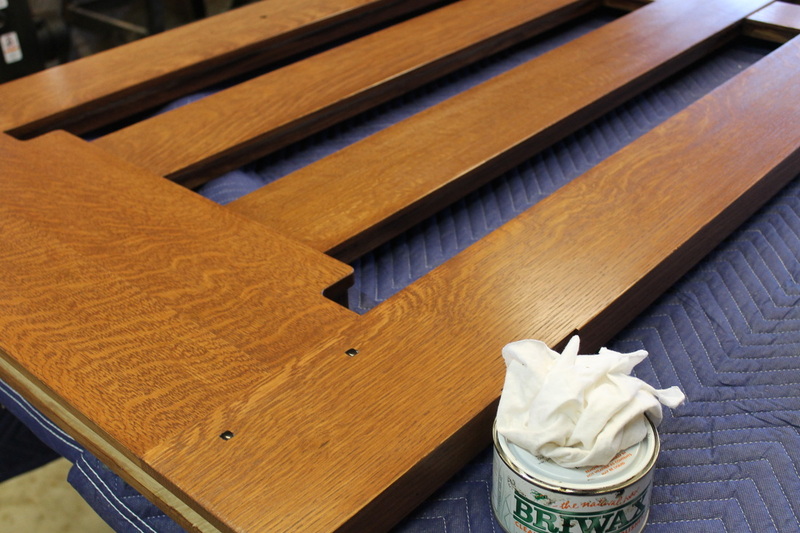 Doors are available ready to stain, primed for paint, or fully stained and finished. My finish of choice is an oil/varnish mix, applied in many thin coats, polished to a satin luster with a high quality furniture wax. To maintain the beauty of the finish, simply apply an occasional coat of wax. Depending on the level of exposure to the elements, it may be necessary to apply a new coat of oil every couple of years in order to keep the wood protected. This is as easy as applying the oil with a soft cotton rag, letting it soak in for a minute, then wiping off the excess. Follow this up with a coat of wax. This will keep the door looking beautiful, provided it is reasonably protected from the sun and rain. Locksets fitting for an Arts-and-Crafts door are available from a variety of manufacturers, including Craftsmen Hardware, Rocky Mountain, Baldwin, Emtek, and others. Most are available in both mortise lock styles or the more common tubular style. Mortise locks offer a traditional, old-world feel, as well as added functionality and security. Tubular locks are widely available from more manufacturers and are a cost-effective alternative to mortise locks. 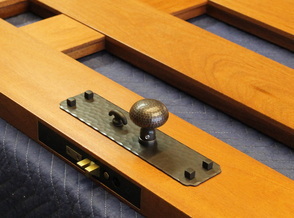 Hinges are available in the same finishes as the handlesets. I use heavy duty, solid brass ball bearing hinges for all exterior doors, insuring smooth operation for the life of the door. There are many options when it comes to glass. A traditional approach is to use beveled glass, but other choices include textured and obscured glass, as well as insulated and Low-E coated glass. For a truly unique door, handcrafted art glass is available from Theodore Ellison Designs. When designing a door that will have custom art glass, Ted Ellison and I work closely in order to create a cohesive design, where elements from one flow over into the other. 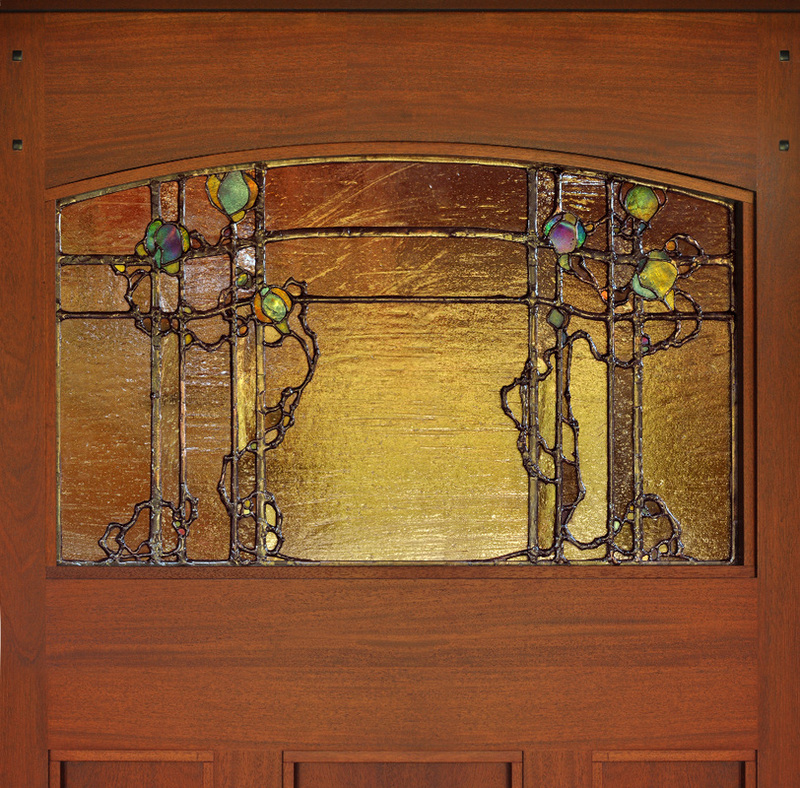 Theodore Ellison Designs creates leaded glass in several styles, from Prairie, Art Nouveau, Landscape, Greene and Greene, and others.